VBA Blawg: Fall for Pro Bono! It’s pro bono week! Here at the VBA, we were so darned excited about celebrating pro bono week, we started a week early! What better way to celebrate what lawyers do for their clients and their communities than to host a conference highlighting pro bono? 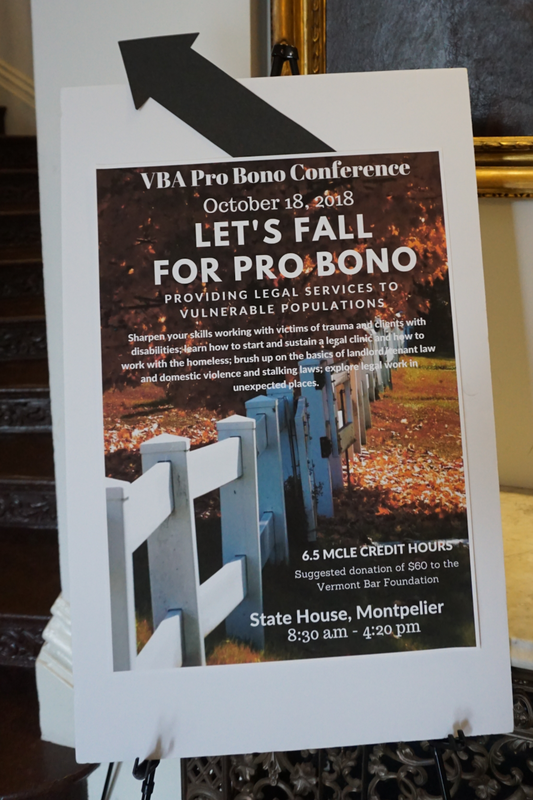 Our bi-annual pro bono conference took place last Thursday in the height of beautiful fall foliage, with the dual theme of Fall for Pro Bono and Representing Vulnerable Vermonters. The spirit of giving was palpable at the conference. Over 100 people attended the program, with the only payment required being a promise to take on at least one pro bono case (and a suggested donation to the Vermont Bar Foundation). Kudos to our Legal Access Coordinator, Mary Ashcroft, who put together an outstanding program! The event was replete with a full day of CLE’s, lunch, a swearing-in ceremony for Vermont’s newest attorneys and a reception. To kick off the event, Mike Kennedy delivered his Ethics of Pro Bono presentation in the well of the House of Representatives at the State House. The attendees were all quite engaged as they tried to answer ethics questions and learned about lawyer well-being. The morning sessions continued with segments on working with victims of trauma, how to start and sustain a legal clinic, working with clients with disabilities and meeting the legal needs of the homeless population. The attendees received some background information on vulnerable Vermonters and learned different ways of approaching clients with needs, accommodating clients with needs and being creative on how they can help. During the lunch provided by the VBA in the cafeteria, Honorable Judge Brown from the US Bankruptcy Court for the District of Vermont, gave encouraging words about the benefits of pro bono. Judge Brown, quoting Winston Churchill, reminded us that “We make a living by what we get, but we make a life by what we give.” She noted that doing good makes us feel good, but it also often turns into more paying work. Pro bono work provides positive outcomes such as good training for new lawyers, a good recruiting tool, good PR for firms and fulfillment of the RPC aspirational goal, all of which improve our practices and our lives. Preaching to the choir of attendees that often choose pro bono, she highlighted just how important all of Vermont’s pro bono programs are to Vermont’s vulnerable population. In the afternoon, attendees learned about landlord tenant law and domestic violence and harassment. Following these seminars was a series of TED Talks (deemed PED talks, with the “P” for pro bono) covering substantive topics such as post-adoption contact agreements, adult involuntary guardianships and bankruptcy. One particularly inspiring TED talk highlighted the importance and value of lawyers serving in their communities on municipal boards or other aspects of local government. The final two TED talks covered avenues for assistance such as the Vermont Volunteer Lawyers Project and the potential of paralegals. These well-attended brief talks were the perfect way to round the CLE-filled day. A recent study commissioned by the Association of American Law Schools found that income potential was now only the 5th most-cited reason for interest in law school. Two of the top five most-cited reasons included opportunities to give back to others and a desire to be an advocate for social change. Suspicion confirmed: new lawyers want to give back! The VBA was proud to celebrate and welcome Vermont’s newest lawyers (over 50) at the Admission of Attorneys Ceremony by the Vermont Supreme Court just after the last seminar. Following the swearing-in, the Vermont Bar Foundation hosted a welcome reception where Vermont Legal Aid introduced Vermont’s newest poverty law fellow, Jill Rudge, who will be focusing on mental health issues.